Bare Metal or Black Shadow? This blog site is just terrific, Philip. The history and the great photos are very exciting. You have only been doing this for a few months and already there’s a tremendous amount of information gathered. I’m 61 and rode for many years on British (Bonnie, Atlas, BSA) then moved to Ducati singles and twins. Congratulations on a job well done. I have bookmarked you and will tune in regularly. I think it comes down to what is easier to keep shined and clean looking? Lots of hand work especially on the the bare aluminum! What a great website, full of treasures….but where is the Fast Lady? 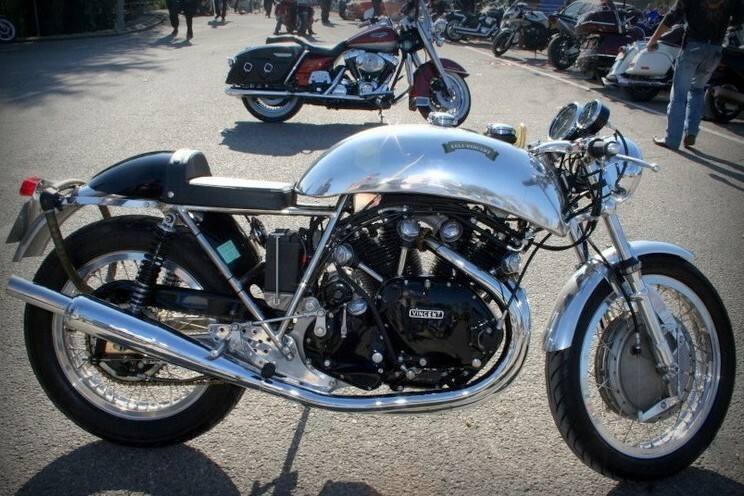 It is the best-engineered Vincent special ever made, and it deserves a long story if not a book! It has a great pedigree and history- please do a photo essay about that great sidecar machine. When they were in production, Vincent machines were road tested with sidecars by the British press, not only sports models but mundae saloon chairs also. The bikes were designed, as we know, with several features designed to appeal to sidecar drivers. I have discovered your site today for first time. Im Vincent owner and driver since about 35 years. A Comet was my 1st motorcycle and now I have a Vincent- Egli type 1000. I have had the surprise to discover on your site that the picture just above “Bare Metal or Black Shadow”, Bare Metal is my own Vincent. I can send you a picture if you send me your email adress. So, your site is very well made, congratulation. Very modern. I like a lot. I encourage you to continue such task. Sorry – but the info on Vincatti is totally incorrect. Here is the real story which was printed in Australian Motorcycle Action – October 1975. ‘It almost looks as if it grew there.’ A simple comment and one which many people make regarding one of the more exotic hybrids around Victoria, Australia. 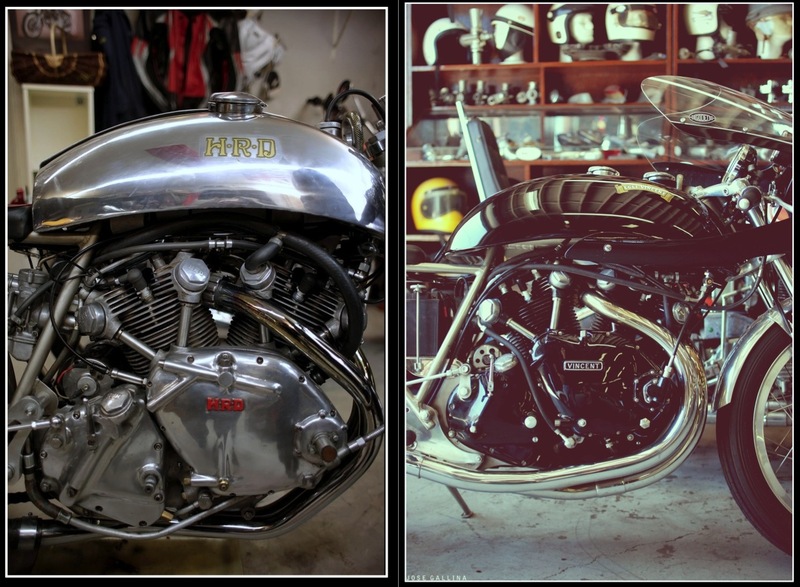 The hybrid is, in this case, the immaculate Vincent engine slotted into a GT Ducati frame and the reason for the comment being more than a little signiﬁcant is that it came from the designer of the Vincent, Warrandyte resident and AMA’s technical editor Phil Irving. Phil made the remark after surveying Max Johnson’s big machine when it ﬁrst made an appearance at the one of the Vincent Owners club outings. And as Phil is not partial to the many variations and hybrids of the traditional Vincent, these faint words of praise indicate he was not unpleased with the Max Johnson version. And indeed there is no reason to have any worries about the unusual cross for the “Vin Duke” or “Duke Vin” or “Vinati” is one of the cleanest and neatest specials we have ever seen. The idea for a Vincent special was not the original intention of Max. He wanted a straight Vincent but when he eventually found a Vincent it was without a frame. In fact it was the engine only . .. in a racing car. It was some three years ago (in 1972) and from there he began collecting and cataloguing items for the Vincent. The idea of building up a bike over a period became daunting as frame parts were difficult to come by. Eventually after joining the Vincent Owner’s Club, Max started to get information and avenues to more parts. 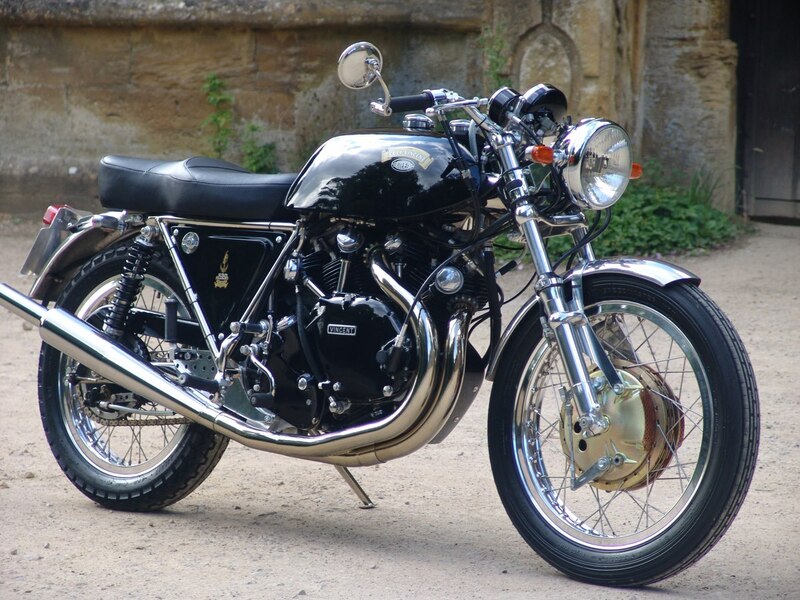 But the frame remained elusive and while he started making enquiries in England a series of events decided him to try slotting the Vincent series ‘B’ Rapide engine he had purchased into a swinging arm frame. The idea came after helping a friend repair a wrecked Ducati 750. While assisting, Max thought that his engine would fit fairly easily into the Duke frame. The next step was to make mock-ups of the cases and try them in the Duke frame . . . just to check how things would need to be altered. From there it was a case of advertising for a wrecked Duke frame and after a few months Max got onto a bare frame and started work. During this time the engine had been worked on, many parts being sent back to England for replacement. The project was not as difﬁcult in many ways as people would imagine but far more involved and annoying in the smaller points. This is was especially so as Max insisted on not modifying or changing any Vincent part just in case he wanted to use them all in an ‘original’ later. So, any changes ha to be made within the framework of making a new part or modifying a part from another make to get the job done. This consumed many hours on the lathe. The front down tubes of the Duke frame were simply cut off and the engine bolted into position . Two spacer plates were required to align the engine sprocket with the rear wheel sprocket and a new bracket to re-mount the shortened down-tubes to the front cylinder head. The end result was two mounting brackets at the front, fully gusseted and two mounting points at the rear, one at the top of the frame and one at the rear section adjacent the countershaft sprocket. The engine looks perfect in the position and the package fits in lower than the Duke motor. The oil goes to a special one gallon container under the seat which still leaves space for a massive tool box . . . needed as there are many types of bolts used on the machine. Max assures us he can almost re-build the bike with the tools carried. The bike Max wanted was a long distance cruiser, reliable and comfortable. Thus he built the engine for torque and power rather than top end. Once the engine was in, then came the electrics, using a 12V Kawasaki 650 generator to give him the lighting required for fast cruising, some 180 W all up. The front end uses Ducati forks bought from another wreck. The discs are the same, twin units which Max bought new. Kawasaki brake hoses are used, and Yamaha switches and hydraulic brake assembly with Suzuki handlebars for comfort. Koni’s fit the rear. Both rims are steel, Max prefers these. 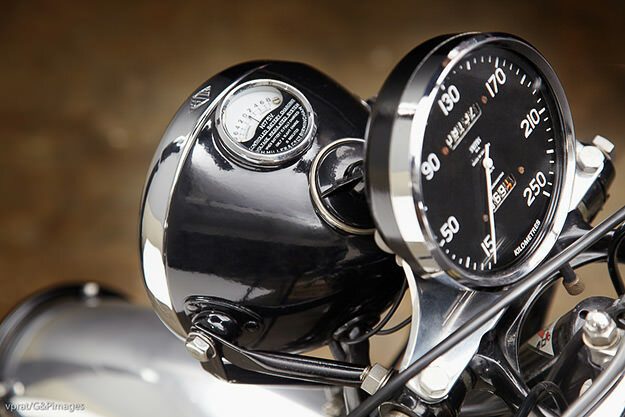 The instruments: are both Duke (Tacho) and Smiths (Speedo) with a handmade fibreglass cowl similar to the GT hood. The tank is a steel Ducati GT painted in Vincent colours with Vincent Badge of course and the seat is the two level touring one. The overall effect of the bike is natural and lithe. With the engine appearing about the cleanest ever seen on a regularly used machine. The engine, being completely rebuilt, is not yet run in but already the massive power of the series B allows it to lope along at 80 mph (129 kph) at a little over three thousand revs. Meticulous attention to detail includes using iron spacers in the gear box rather than alloy which may break or flake. Max wanted to have the bike ultra-reliable for many miles. The other problem of frame ﬂex and vibration has been partially overcome by the fact there are three cush drives in the bike. The Triumph plates and outer have one, another on the countershaft sprocket and the third on the standard Ducati rear wheel- This does mean though, that there is a lag between throttle twist and response which initially gives the feeling of a slipping clutch. Other changes include using a Triumph clutch housing and plates to provide easier city riding. A fair amount of work went into ensuring it worked well. In fact Max has spent time on almost every facet of the machine. The bike is still fitted with 30mm Amal concentrics but these will eventually be replaced by Mikunis. Triumph air cleaners ensure the new internals of the big B series do not get damaged by the dirt and grit in our atmosphere. Another change will be the ﬁtting of a double start oil pump to replace the standard one to up the circulation required for the Australian climate, which is far hotter than the European climate it was designed for. For the rest, the bike is immaculate. Not perfect, for Max wants the machine to ride. In gleaming chrome and polished alloy with the black paintwork the bike is a contemporary work of art and a living compliment to the mighty Vincent engine. Watching it and then riding it proved the vast difference between it and the Ducati. The throbbing lusty power that will last forever and a much more useable power band, although this is the wrong term to use for both machines; they are all torque. Overall the project took Max 18 months from the time he got the frame until registering the machine. And around $1000 which is staggering That does not include the hundreds and hundreds of man hours and the labour spent getting things made and building it all. That’s what the machine is all about. But for Max the project is just the start. He already has the frames and parts from England to build complete ‘B’ and ‘C’ series engines and intends starting a ‘straight’ Vincent. Unlike many hybrids the solo B “VinDuke” handles exceptionally well, with slightly more weight on the front than with a Ducati, stable and predictable tracking and excellent ground clearance. It is the sort of bike that turns people into believers. Subsequent to our own Max Johnston building the world’s first Vincati in the early 1970’s, Max provided his templates, plans and guidance to a number of folks around the world, including the late Big Sid Biberman who’s Vincati, appeared on the front cover of 998, number 195. 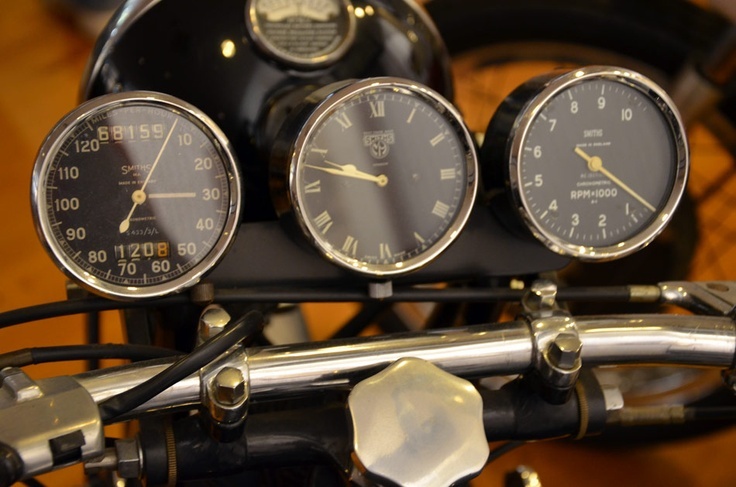 I am a fan of classic motorcycles , especially the decades 50, 60 and 70. I love the British and Italian motorcycles those years. I recognize the technological advancement of Vincent that were ahead of their time. Currently I have a Kawa W800 that is the closest thing to a British twin late 60s I congratulate you for your work on this site. I have a Comet and several Velocettes. I would love a tuned Comet engine in an Egli frame, preferably with an electric start, belt drive primary and a 5speed box. Just taken delivery of a new build JMC Egli Vincent , 1200cc. Sending pics to your email. After several years building Egli Vins , JMC have fine tuned their design version to an impressive machine that ticks all the boxes for me. I like the shiny B!! Will it be at the International this year in Italy?? I just discover your site ! great ; i’m too busy toady to read everything ! another day ; next month I will be retired so ,plenty of time but more than 12 Vincent to rebuilt !!! I enjoy your website very much but find much of the small text is not black but almost gray which makes it difficult to read. This happens only on your site so I assume it is a setting you choose. Are you looking from a computer or a mobile device? Philippe, There has been an improvement. Great, I raised a ticket and they might have done something as the font is not customizable. Just recently I became the owner of a Egli-Vincent, after around 40 years of asking/nagging. First and only owner was a good friend of mine who picked up the Egli from Roger Slater in 1969. My friend’s trip to pick up the Egli from Slater is a story of it’s own. Tried to paste a photo, but with out success. Hi Philippe, I havemoved to Queensland to where the Egli is i tried to ring you regarding the frame no.no washer however TerryPrince told me shortly after i bought it its history. I wish to sell its been inside my house for about 35 years with a few other bikes.